Get Subway Coupons 2014-2015, promotions, coupon codes and printable Subway Coupons right here. We update this site monthly with the newest Subway coupons and current deals, all here on 1 page! Most newer coupon information will be posted in the comment section at the bottom of the page. For the FULL Subway Menu and for Subway nutrtion information, please see our page: Subway Menu. Subway is very active on the printable coupon front, and less so when it comes to Subway coupon codes or promo codes. Most coupons for Subway are 1$,2$ or 3$ off printable coupons that can be found online and must be printed, or similar coupons, like Buy one Get one Free coupons, or buy a Sub and any drinks and get a free sub, which are delivered as pamphlets in the mail etc. Check your local papers for coupons. Especially your sunday paper. Check your junk mail. Subway often do mass sendouts of Buy one Get on efre coupons in the mail. Search online for coupons using ‘image search’ Most will have expired, howver. Search Ebay. This is a neat trick for getting cheap Subway coupons. Just make sure that the haven’t expired and that the delivery time is not too great. Search THIS site and here return often. We post new ofters in the comment section. 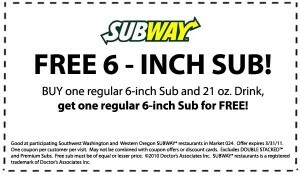 Typical FREE SUB Subway coupon. 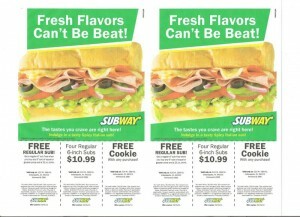 Example of Free SUBS Subway coupons, that must be handed in at the participating Subway’s store. You can enlarge the image and read the small print for the coupon conditions. Please see our page: Subway Menu, for the FULL Subway Sandwich Menu. Please check back regularly for the latest Subway coupons, promotions and deals. Subway gift cards have NO EXPIRATION and NO FEES! The Great breakfast offer is still going strong: the 3$ Breakfast. Get a drink and a 6 inch sandwich for 3$. Drinks: 21 oz Fountain or 16oz coffee. Black forest ham, eggs and cheese. Available until 11am at participating subway restaurants. 6 inch Oven Roasted Chicken sub for just 3$! Footlong Special Buffalo Chicken sub for just 6$! FOOTLONG FRENZY CONTEST COUPON CODE: knaymr6h. Limited time Subway “Footlong Frenzy” contest code.